With access to some of the very same tools that our developers use to create GTA Online Jobs and now with over 2.5 million created thus far at Social Club, fans have certainly been putting the Deathmatch & Race Creator to work. Our latest edition of Rockstar Game Tips is designed to help you get the most out of the Race Creator, with some general guidance that should ensure your Races are intuitive and fun to play. Many of these tips are in direct response to questions and comments we’ve received at the [email protected] email address, where we’re constantly reading your feedback about all things GTA Online as we continue to grow and refine the experience. For avid Creators out there, read on for Race game design pro tips including some do’s and don’ts specifically suggested by our dev teams who are on the lookout for standout Jobs with Rockstar Verified potential. Definitely take note if you’re aspiring to join that illustrious group with one of your custom-made Jobs. For those yet to jump into the Creator, we’re leading off with a guide to getting started, and be sure to look out for a future Game Tips article covering Deathmatch creations very soon. Your first decision is to settle on which kind of Race you would like to build. Over and above deciding on a Land, Sea or Air Race, is it going to be a multi-terrain endurance on two wheels, a coast-to-coast sprint in classic sports cars, a jet stream through the city to test those knife flying skills, or something else entirely? Knowing this from the outset will give your Race a sense of identity that you can work towards when creating it. In the Race Details Menu, you can set a range of parameters, including available vehicles, time of day, number of laps and weather. And don’t fret: all of these details can be adjusted later on should you change your mind or discover something’s not quite right during play-testing. Get off to a good start with your starting grid placement. Your first step in creating a Race is placing a Trigger. This is where players will need to go in Freemode to start your Race and also the approximate area where the Starting Grid will be. If you’re currently far away from where you’d like to start creating, just hit the Start button and select where you’d like to be on the map to head there instantly. You can also take a shot for the Lobby Camera, selecting the backdrop where players will gather before the start of the Race. Your next port of call is to lay those all-important Checkpoints that will mark out your Race route. You can navigate around the game world using the left stick to move the camera, the right stick to pan and the L2/LT and R2/RT buttons to zoom. Take your time and carefully consider what terrain and locations you want your Race to cover, especially considering the Vehicle Settings you decided on in the Race Details Menu (although these can be changed at any point). If you want to insert a new Checkpoint between two already existing ones, make sure the new Checkpoint is touching the blue line that appears on screen between the two previous ones, otherwise it will be placed at the end of the Race. The blue line will be highlighted yellow to indicate that you’re going to insert a checkpoint between two already existing ones. If you select Laps as your Route Type in the Race Details Menu, then bear in mind that your Race layout will need to loop back on itself to work well. If you select Point to Point, then the final Checkpoint you place will automatically become the Finish Line. Note that all Races must be at least 0.62 miles and you must have completed at least one full Test (although we highly recommend doing more than just one Test of course for proper due diligence) before you can Publish. Creative placement of Props, Weapons and Boosts is your opportunity to add to the existing layout of the game world and come up with something truly unique, so play around with it! 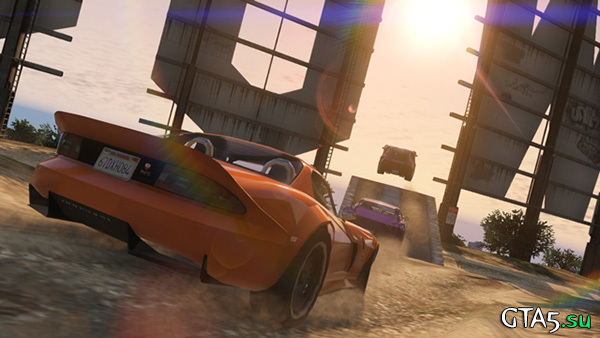 For those who choose to play it as a GTA Race, you can place Weapons, Health and Boosts along your Race route. These can all be found in the Placement > Weapons Menu, while Props can be found at Placement > Props. Smart placement allows you to block off a bridge, build a jump to add a little Vinewood spectacle to proceedings – or anything else your imagination can summon. You can also place a Stunt Jump so that the camera will cut to a special angle when going over a specific ramp. To do this you will need to place two markers – one at the end of the ramp, where players will take off from, and one to set the position of the Stunt Jump camera. The camera’s height can be adjusted by pressing the analog sticks. Creating Land Races and Sea Races follow a similar process other than the obvious distinction that Land Race Checkpoints can only be placed on solid terrain and Sea Race Checkpoints can only be placed on water. Also be aware that certain Props can only be placed in certain areas: Buoys and Water Ramps, for example, are designed specifically for the wet stuff. When creating Air Races you also have to consider the height of each of your Checkpoints – you can raise each Checkpoint by clicking in the left stick and lower them by clicking in the right stick. As with all game development, rigorous testing and refinement is the best way to come up with something truly special. You can select the Test option at any point to play the Race for yourself without worrying about losing any of your progress. If you discover something you’re not happy with, return to the Creator by hitting down on the d-pad and you’ll shoot right to that point for a quick tweak or a major overhaul. You can also switch to in-game camera by pressing the Select/Back button to place Checkpoints and Props from the comfort of your vehicle. Not only does this allow you to place Race Checkpoints on the fly, it also gets you into areas that the Creator cursor can’t reach, such as underground tunnels. When testing Races, it’s important to make sure each of the respawn points works properly, especially if they happen to be close to an obstacle or large structure. It happens to the best of us: sometimes you end up with a road to nowhere and Checkpoints messier than a Trevor Phillips bar crawl. If you want to go back to a blank canvas at any point, you can delete all Checkpoints or everything entirely in Placement > Delete Options (you can also delete All Weapons, All Props, All Dynamic Props, and All Stunt Jumps). Then publish your Race on the Social Club website for all to enjoy. Now that you’re acquainted with some of the basic functions of the Content Creator, here are some words of advice to ensure that your Race stands out from the crowd. Always make sure the next Checkpoint is easily visible. You want your Races to be settled by skill, not confusion. For tight turns, place your Checkpoint slightly before the apex of the corner. This will give the player ample notice to brake and allow them to focus on maintaining a good racing line. 99% of the time, a well-placed Checkpoint is a better indication of an upcoming turn than a row of wrecked buses. Use the description to let your players know how best to play your Race. If you’re using lots of Props to create roadblocks, for example, and you find in testing that the Race plays better with traffic disabled, let people know that. Make sure Weapon and Health pickups are placed far enough apart so that a single player can’t grab them both at the same time. This will keep your GTA Race competitive by not giving the leader too great an advantage. Weapon pickups, specifically Rockets, should be used sparingly enough so that they present a potential turning point in the GTA Race, rather than a constant malaise. Consider placing them where they might be most tactically effective, like at the beginning of a long straight section. Remember that all created Races can be played as GTA Races but only if you take the time to place weapon pickups. Ensuring that your Races are well-balanced and enjoyable in both standard and GTA Race formats gives your players an incentive to come back for more. Jumps should also be used sparingly. Too many jumps, or badly placed ones, can harm the flow and make your Race memorable for the wrong reasons. Boost pickups should be placed on straight sections and key overtaking positions where they can be most effective. 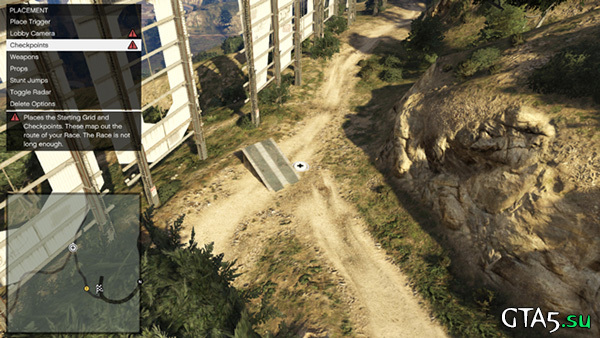 Don’t place Stunt Jump cameras before turns as the player may lose sight of their vehicle. Vehicle selection should always be carefully considered according to the layout and terrain of your course. 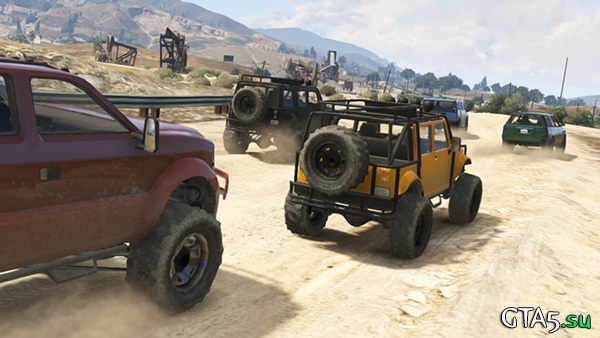 Compacts are best suited to intricate city routes while the Off-Road class of vehicles is most at home in the mud and blood of Blaine County. If you’d like to experiment with different combinations of vehicle class, such as Sports Cars and Off-Road, then you’ll want to mix up the terrain and course so that neither has an inherent advantage. You can even select parts of the game world that provide split routes, such as tight, risky shortcuts for bikes on mountain trails. Balance is everything and the way to achieve that is through meticulous testing – try out your Race using various vehicles until you’re consistently setting similar times across the board. Air Races should test pilots with a mixture of vertical and lateral, side-to-side movement, in order to break the routine of straight flying for long periods of time. There are no handbrakes in the sky so extremely tight turns might make your Race too difficult or even unplayable. You may find it useful to switch to the in-game camera to get a feel for the turning capabilities of each aircraft when fine tuning Checkpoint placement. If you really want to test your players’ cockpit skills then think about how to combine Checkpoint placement and the game world itself to create challenging sections. For example, a series of Checkpoints weaving above and under bridges will test their altitude control, while placing one between neighboring skyscrapers will force them into knife flying position. With everything here, experimentation is the key, so play around and have fun! When you’re completely happy, hit Publish and your Race will be available for the Social Club community. 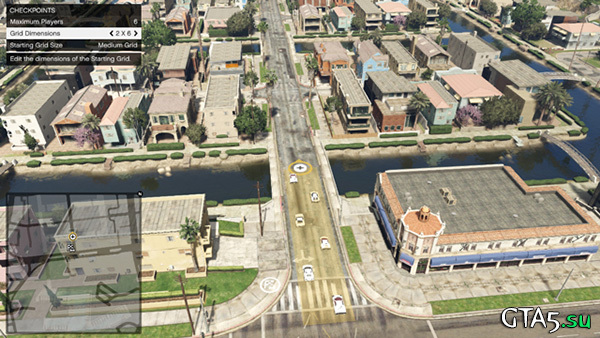 Players in your Freemode session will be able to access it via the Social Club website and from there they can download, play, rate and share your Job at any time. We hope these tips help you perfect your created Races and look out for our tips on Creator Deathmatches here at the Newswire very soon.